The little pipsqueaks are growing! They are the cutest. I can never get a good picture of them because they will NOT sit still! They are constantly moving and when they see me with the camera they really run! They DO NOT like their picture taken. Silly things. You can start to see the pretty speckles on the Speckled Sussex chicks. The mystery chick just might be a Rhode Island Red? Time will tell. I had purchased 2 buffs but one is definitely NOT a buff. You can see her in the picture above. She has LOTS of coloring and speckling on her wings. At first, I thought ISA Brown, then possibly Rhode Island. I'm leaning more Rhode Island, but time will tell. It's so hard when they are so little and their appearances change SO FAST! It's amazing how on some you would NEVER know that is what they looked like when they were younger. 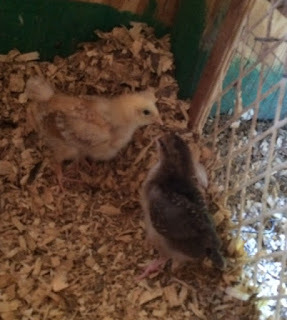 Even as they grow through stages they sometimes look like completely different chickens. If you saw a timeline of pictures of some breeds you would swear you were looking at completely different chickens. UPDATE on Misty Dawn: She has perked up. Something is still off and not right with her but she is eating, drinking and pooping. She hasn't laid an egg since she came in and I'm pretty sure she was the one laying an egg a day because I haven't had ANY eggs in the coop like the one that I am sure is hers. We are certainly enjoying the cooler weather right now, especially in the evenings. Fall has finally come. Spring and fall are my favorite times of the year.